Inspired by @Sarah initially and then @Cheltgirl, I've refurbed my starting 19L intoooo...... a shrimp tank! It's really nothing fancy. Basic heater, some new substrate and a new light. This tank had been running still (no stock) for a while now, I was just putting a pinch of food in each week to keep the munchers going. Moved the filter to Bertha while I cleaned it all out and redid the substrate. Chopped up half a Seachem fert tab for the dwarf grass. I did want to get some moss but none of the shops had any, so I reseated the hair grass that was in there and somehow still alive. 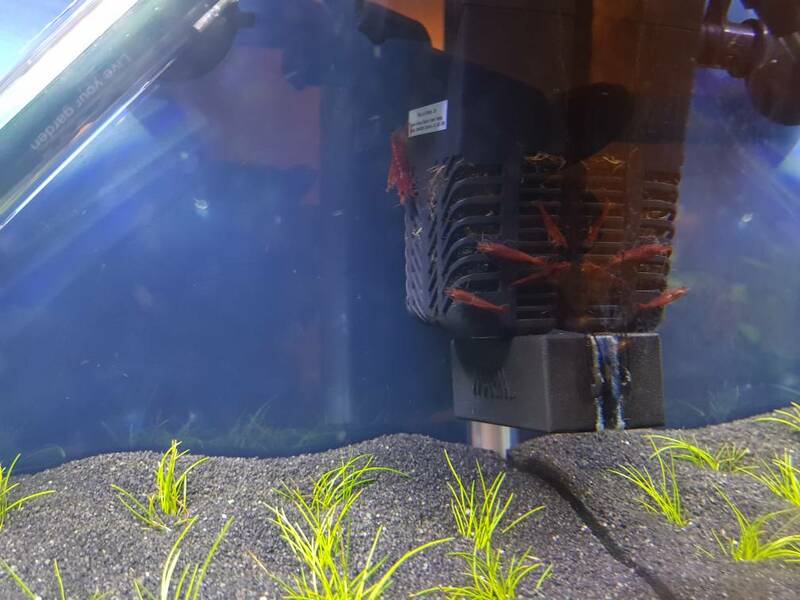 8 cherry shrimps later (drip acclimated) and boom! I have always fancied a shrimp only tank. Yaaaay! The perfect little kitchen tank. Getting up in the morning will be so much nicer you can go downstairs, put the kettle on and have tea/coffee, toast and marmalade and get a ten minute dose of shrimp escapades to start the day! It’s a good sign that all is well. (25-03-2019, 08:51 PM)Cheltgirl Wrote: It’s a good sign that all is well.